To boost immune system functioning. How has Ear-Heal helped others? What do Ear-Heal Drops contain? How do I use Ear-Heal Drops? How long does a bottle of Ear-Heal last? Ear infections are a very common complaint and can affect adults as well as children. Otitis Media (infection of the middle ear) affects the area behind the ear drum. A build-up of fluid and pus behind the ear drum leads to raised pressure in the ear, pain and loss of hearing. Infection in the outer ear canal, called Otitis Externa, can cause inflammation, pain, discharge from the ear and itchiness. Chronic Otitis Externa can also predispose people to recurring infections of the middle ear. There are a number of possible causes of ear infection, including bacteria, viruses and fungi. Colds and allergies may also have a role to play when they cause inflammation of the Eustachian tube, blocking normal drainage of the ear and leading to middle ear infection. In many cases, ear infections recur after conventional treatment and may become chronic and difficult to get rid of. Recurring ear infections may also lead to permanent hearing loss if not treated properly. Conventional treatment of ear infections generally involves oral antibiotics and sometimes medicated drops. Though often effective in clearing the initial infection, antibiotics may compromise the immune system, leaving you vulnerable to recurrence and chronic infection. Antibiotics are also not effective against fungal infections of the ear. Natural remedies can effectively reduce the pain, inflammation, throbbing and discomfort of ear infections and treat the underlying causes without the side-effects and lowered immune functioning so common with antibiotic use. Natural remedies can also be very effective in the prevention of recurring ear infections, thereby guarding against hearing impairment caused by chronic ear infection. Ear-Heal Drops are a safe and effective, internal treatment for ear infection, especially formulated for adults and children over 10 years old (babies and children under 10 use Eddy Ear Sprinkles). Ear-Heal Drops are an effective natural alternative to antibiotic treatment of ear infections and are an excellent companion to our Ear-OK ear drops, which are used internally directly in the ear. Echinacea purpurea is the best known and researched herb for stimulating the immune system. Over 500 scientific studies have documented the effectiveness of this herb. Research has shown that Echinacea increases the activity of the immune system cells, reduces inflammation and inhibits growth of bacteria, viruses and fungi. These properties make Echinacea the ideal herb for treating infection and reducing inflammation in the ear. Belladonna (30C) treats ear infections of sudden onset with high fever and swollen glands. Levisticum radix (30C) is another homeopathic remedy useful in treatment of longstanding ear conditions and chronic earache. Levisticum is also very effective in drying excess mucus collected in the ear. Contains less than 1% pure pharmaceutical grade ethanol when diluted as directed. Like all Feelgood Health remedies, Ear-Heal contains no gluten or artificial flavors, preservatives or colorants. 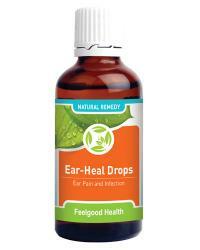 Ear-Heal Drops come in a convenient tincture form. Adults: Drink 15 drops diluted in 1/4 cup of water or juice two to three times daily. Children over 10 yrs: Use one drop per age year of the child diluted in a little water or juice. Note: Use concurrently with Ear-OK Ear Drops. Ear-Heal Drops are intended for internal use to build up the immune system and treat the ear infection from the inside, while Ear-OK Drops are applied directly into the ear for fast relief. Improvement in discomfort, itchiness and pain should begin within the first few days of use and will continue to improve over 1 - 3 weeks of regular use. One 50 ml bottle of Ear-Heal will last for approximately 30 days at adult dosage. A 120 day supply of 4 bottles is offered at a discount. See the Buy 3 Get 1 FREE special. My 9 month old baby girl has an ear infection that is making her miserable. Can I use Ear-Heal drops for her safely? Ear-Heal drops are specifically intended for adults and children over 10 years old and would therefore not be suitable for your baby girl. However, our Eddy Ear Sprinkles would be perfect for her and will safely and effectively work to clear the infection and soothe the symptoms that are making her miserable. Eddy Ear Sprinkles are also very easy to administer to babies and small children, who always love the taste! Can I use Ear-Heal in conjunction with antibiotics? Yes, you can. Although antibiotics may cause side-effects and reduce immune functioning, in severe ear infections they may be necessary. Ear-Heal Drops will then be an excellent additional treatment for reducing inflammation, pain and itching topically as well as preventing further growth of yeasts and fungi in the ear - organisms that antibiotics do not kill. If in doubt, it is always worth discussing with your doctor whether the antibiotics are, in fact, strictly necessary, before deciding whether or not to use Ear-Heal drops together with antibiotics. This is because Ear-Heal drops are a very effective treatment for ear infections, especially when combined with Ear-OK ear drops. In most cases it is not necessary to use antibiotics concurrently. My ear is not painful but is constantly itchy - could this be an infection? Ear infections commonly cause pain but sometimes when the outer ear is affected rather than the middle ear, itchiness may be the predominant symptom. It is best to see your health care provider who will be able to confirm whether or not your ear is infected. What else can I do to heal my ears and prevent recurrence of the infection? Don’t smoke and protect your children from second-hand smoke. Tobacco smoke increases the frequency and severity of ear infections. Protect yourself and your family from colds by keeping your immune system in peak health, avoiding very crowded places and washing hands frequently. Regular use of our Immunity Plus formula will help to keep your family in peak health and avoid the cycle of colds, congestion and ear infections so often common in the winter months. Keep immune system healthy for fighting infections by eating a well-balanced diet, exercising regularly and avoiding antibiotics when possible. Try not to scratch in the ear or insert ear buds in an attempt to unblock ears. This only introduces more infection and can also damage the ear drum. Happy Ear Combo: Internal and external drops for ear health inside and out!